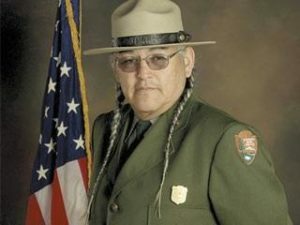 Gerard Baker, a full blood member of the Mandan-Hidatsa tribe and the highest ranking American Indian in National Park Service (NPS) history, is a familiar face on American Public Television. He appeared prominently in the Ken Burns and Dayton Duncan’s film The National Parks: America’s Best Idea. He is also a widely recognized public figure throughout Indian Country for his work as mediator and facilitator between the Service and tribal governments on an exhaustive range of public policy issues. Baker was born on the Fort Berthold Indian Reservation, Mandaree, North Dakota. Growing up in a traditional Indian home on his father’s cattle ranch, he spent time breaking horses, running cows, and doing chores. At night, he listened to stories told by family members and tribal elders – stories of warfare, great hunts, legends, and the survival of his people and culture. Baker attended reservation schools graduating from St. Mary’s High School in New England, North Dakota. In 1979, he earned a bachelor’s degree in criminal justice and sociology from Southern Oregon State University and an honorary doctorate in public service from the South Dakota School of Mines and Technology in 2007. Baker began his NPS career in 1974 as a seasonal at Theodore Roosevelt National Park, Medora, North Dakota. His first permanent assignment in 1979 was as a park technician at Knife River Indian Villages National Historic Site. He served as historian at Fort Union Trading Post National Historic Park before serving as district ranger at the North Unit back at Theodore Roosevelt. In 1990, Baker transferred to the U.S. Forest Service serving several years before returning to NPS as superintendent of Little Bighorn National Monument. In 1998, he became superintendent of Chickasaw National Recreation Area in Oklahoma and in 2000 became superintendent of Lewis and Clark National Historic Trail. From 2004 to 2010, Gerard Baker served as Superintendent of Mount Rushmore National Memorial. From April 2010 until his retirement later that year, he served as the assistant director, American Indian Relations, at NPS headquarters in Washington, DC.